The news bulletin began innocently enough with the heading: “Bleriot’s New Launching Device.” What it described, however, was something that in other times might have been a matter of greatest secrecy. 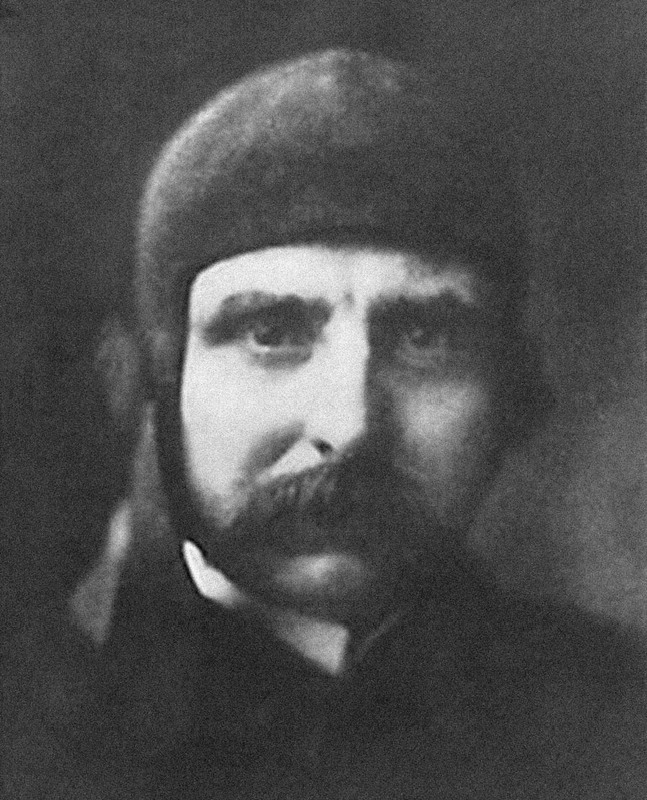 Unexpectedly, Louis Blériot, the first man to fly the English Channel in a powered airplane, had developed a system for launching and recovering aircraft from the decks of the naval ships. The British War Office and Admiralty proved to be very interested in the development — all the more so because it might mean that the French were racing ahead of Britain in naval air power. And Blériot, ever the entrepreneur, was eager to find a market for his latest invention. However, despite its obvious potential, Blériot’s venture was ill-fated. Like many other early efforts at pioneering new solutions for naval aviation, it would soon be forgotten, nearly lost in the annals of aviation history. 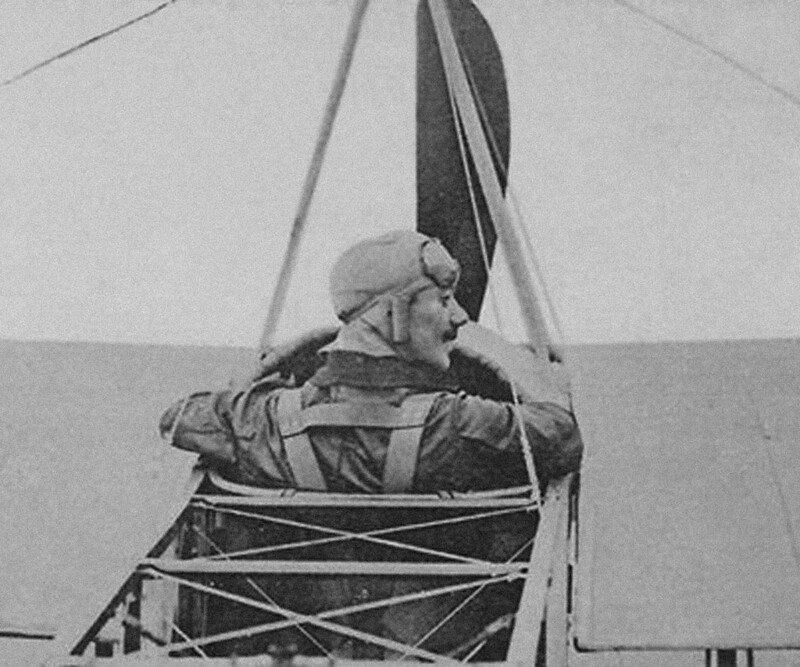 Louis Blériot in his flight helmet. Blériot’s little known naval innovation was revealed in a rather short article appeared in the August 2, 1913, issue of Flight, the newsletter of the Royal Aero Club, which landed in mailboxes throughout the United Kingdom 100 years ago today in aviation history. 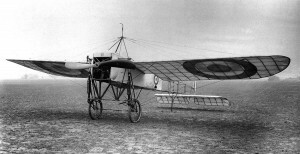 A Blériot XI with the RFC; the War Office proved a keen buyer of Louis Blériot’s proven designs. 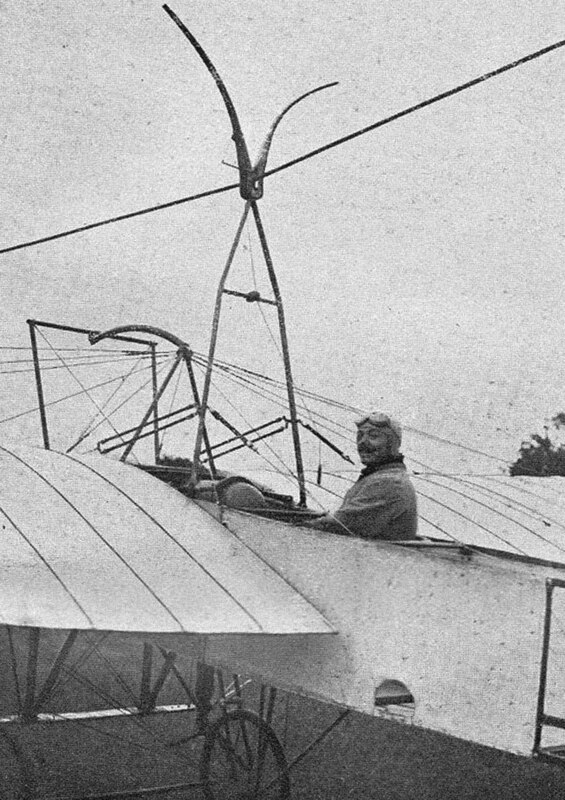 Adolphe Pégoud in a Blériot, probably at Buc. Whether or not the terms,”flies off in the ordinary manner” were really accurate is something of a question. In fact, the line, just 80 meters long, was mounted between two towers — once unhooked, the pilot had to quickly turn to avoid hitting the second tower. 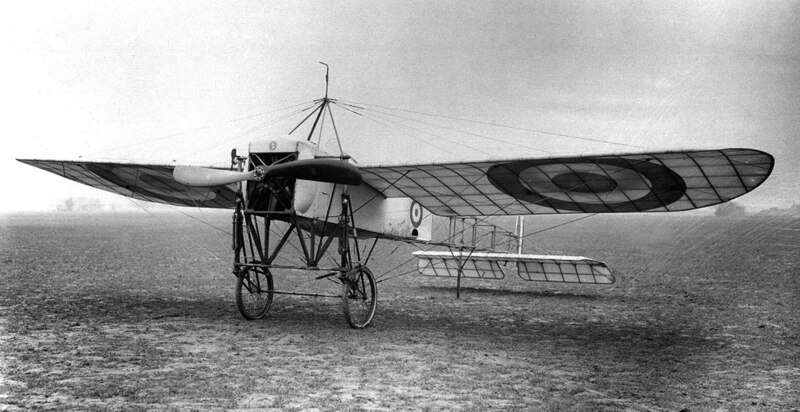 Despite the shortcomings of the system, the French flyers at Buc had developed something of interest and with Adolphe Pégoud flying a trusty Blériot XI variant in the films, the system clearly it appeared to be a reasonable for naval use. 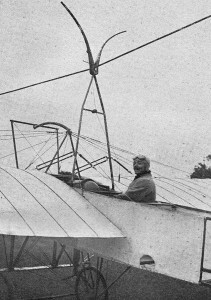 An exceedingly rare photograph of Adolphe Pégoud in a Blériot XI equipped with the cable launching device — at the top can be seen its distinctive pair of horns and the launching cable. 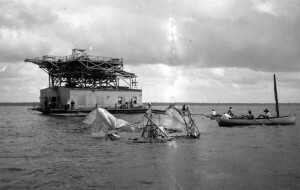 In fact, the idea of using booms mounted sideways on the vessel overcame the natural difficulties that resulted from the two tower system that had been shown in the film. With the booms, no obstacle forward or behind would limit the pilot’s approach and departure. While it might well have worked, sadly for Louis Blériot, none of the systems were ever sold. Ultimately, the British had a few ideas of their own, mainly based on the American pioneering efforts with “flying off” platforms. Such decks were mounted on British ships just before the outset of the Great War (World War I). 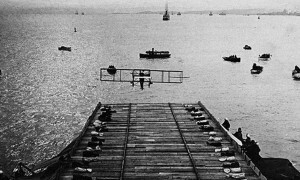 The idea was taken from the Americans, who, on November 14, 1910, nearly three years before Blériot’s system, managed the first take off from a ship-mounted platform — this was from the cruiser USS Birmingham. By January of 1911, the Americans had landed on the decks as well. 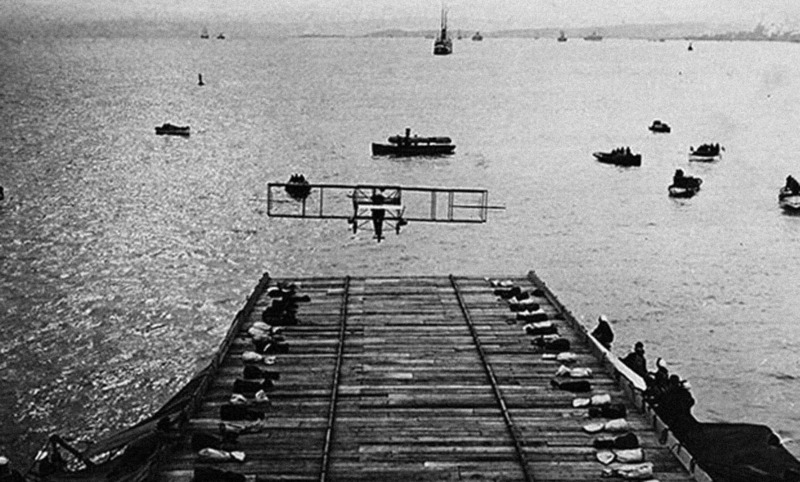 The rest of the naval world would soon follow suit, even if seaplanes remained the primary focus of naval air power. Seaplane tenders and other vessels would carry aircraft into combat during the Great War. 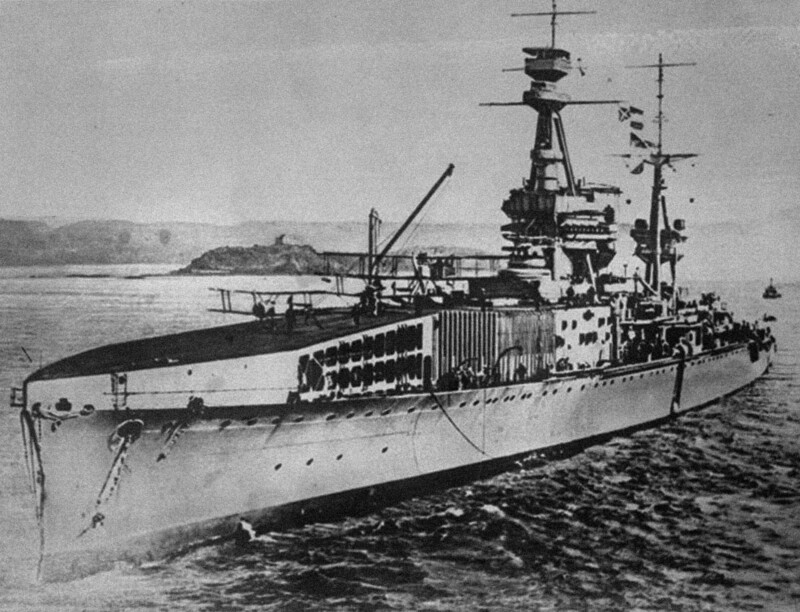 It wasn’t until February of 1917 that the British pioneered the world’s first true aircraft carrier — well, sort of. With a rather lengthy addition of a flying off deck mounted ahead of the main superstructure of a light cruiser, the British began a long linee of innovations that resulted in today’s, modern aircraft carrier designs. By August 1917, the first plane had landed on the decks of the cruiser in question — HMS Furious. By the end of the war, a second aft deck had been mounted, which was termed the “landing on” deck. This was ultimately modified in 1922 to become a single, continuous deck. 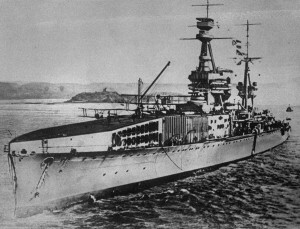 Heavily retouched photograph of HMS Furious with its aircraft deck on the bows. The catapult system that would be widely adopted despite Blériot’s best efforts with his line system. Yet catapults, contrary to common wisdom, were not developed by the British. It may come as a surprise that the first airplane catapult was pioneered by the Smithsonian’s Secretary and famous early aviation pioneer, Samuel Langley. While Langley’s aircraft failed in its attempts to achieve flight, his spring-driven catapult system worked reliably. Notably, a year later, the Wright Brothers would develop their own weight, pulley and derrick catapult system. Most confuse the issue because the British invented the modern steam-catapult in the 1950s, a system that is still in wide use globally today, though it is now potentially to be replaced by a new generation of electro-magnetically based accelerators. Great article, I have never heard of the Bleriot system until now. 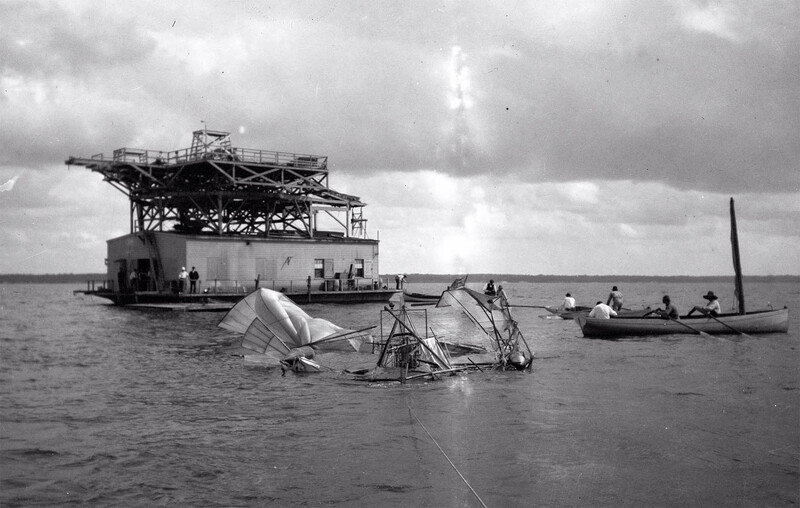 During WWII, a similar system was used by the U.S. to launch and recover L birds, Cubs and such. I saw a video of this system in operation at the EAA fly-in at Oshkosh some years ago. How about an article on the man carrying kites rumored to have been used and towed by ships in convoys to detect U-Boats? This is a fascinating article about a little known phase of Bleriot’s career. The comparison to Eugene Ely’s shipboad adventures is interesting, however the photo of him landing on the USS Birmingham is mislabeled (an error originally done by the USN as well previously). The photo is actually of Ely landing on the USS Pennsylvania. If you look closely you will see sandbags at either side of the deck connected by ropes. This arresting system was devised by fellow Curtiss aviator Hugh A. Robinson who had previously used a similar system when doing his “Circle of Death” thrill ride on a bicycle and later motorcycle at County Fairs, etc. In fact, Robinson can been seen at the bottom left corner of photo, laying on deck! Thank you for your posting. The argument you make is convincing; we had cited the photo based on the US Navy’s captioning, though, as you point out, that was erroneous. The fact that the cables are visible lends great credence to your statement and thus, we will amend the caption accordingly.